It's exhilarating to experience the freedom of having a driver's license and the chance to explore the open road. Most teens have waited and worked for a long time to get behind the wheel. However, new drivers are at a much higher risk for car accidents than more experienced drivers. Car accidents are the leading cause of teenage deaths. 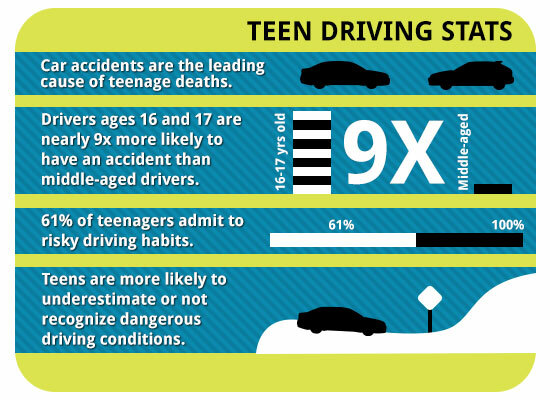 Drivers ages 16 and 17 are nearly 9x more likely to have an accident than middle-aged drivers. 61% of teenagers admit to risky driving habits. Teens are more likely to underestimate dangerous driving conditions – or not recognize them at all. If the thought of your son or daughter sitting behind the wheel of a car gives you anxiety, you're not alone. We created some resources to help you better understand the process of teaching your teenager to driver. Visit our Tips for Parents of Teen Drivers webpage for some great resources to help you navigate your time on the road. It's important to keep our children safe and provide them with the best experience possible when learning the rules of the road. Knowledge and experience are the most important steps to creating safe teen drivers. The following pages offer insight, opportunity, and information that can help any young driver conquer the dangers of the road. If you were injured in a car accident, our legal representatives are standing by to help. We'll answer your questions and help you determine the best course of action for your situation. We're available any time, so call us today.